Gerhard Heiberg has been a member of the International Olympic Committee (IOC) for the past 23 years. 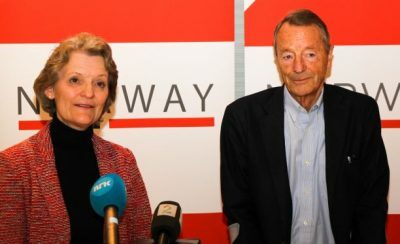 At the age of 78, he passed the torch to another Norwegian at an IOC meeting in Lima, Peru over the weekend. Kristin Kloster Aasen, age 56, said she was both “proud but very humble” to take on the tole. Aasen, who has most recently served as first vice president of Norway’s own athletics federation (Norges Idrettsforbund, NIF), was before that president of the country’s horseback riding federation Norges Rytterforbund. Heiberg tapped the low-profile Aasen as his successor last year, when his own battle with cancer prompted him to step down two years earlier than expected. Newspaper Dagsavisen reported how it’s not IOC’s member countries that elect its representatives to the IOC but rather the IOC itself that chooses its members. With Heiberg on his way out, he could nominate his successor. Her selection is backed, however, by NIF’s board. Then she was approved by IOC’s nomination committee, and elected at the IOC meeting in Peru. Heiberg, meanwhile, was elected as an honorary IOC member after his long Olympic career that started when he led the organizing committee for the 1994 Winter Olympics in Lillehammer, famously dubbed by the IOC’s former president Antonio Samaranch as “the best Winter Games ever.” Many agree. In an interview with Aftenposten last week, Heiberg reminisced about his long stint on the IOC, how he drank many beers with the former Candian prime minister to extract a national financial guarantee for the 2010 Winter Olympics in Vancouver, how he has endured criticism and made mistakes over the years, how an unnamed athlete creatively tried to defend his doping and how attempts were made to bribe Heiberg himself. He acknowledged how the IOC has lost respect in recent years and how Oslo’s recent refusal to host the 2022 Winter Olympics has led to reforms. “The IOC is now open for much more communication with cities applyng to be hosts, instead of telling them what will happen,” Heiberg told Aftenposten. “Both want to save money. Oslo’s ‘no’ has contributed to change.” He’ll now adapt to some changes, too, with a calmer pace and more anonymity. Aasen takes over immediately.